The U.S. Embassy in Havana (CNS photo/Alejandro Ernesto, EPA). When news of the alleged sonic attacks against U.S. diplomats in Havana broke over the summer, it sounded like a spy-versus-spy game gone terribly wrong. But months later, U.S. officials say they have yet to solve who or what was really responsible for the supposed acoustic blasts that left some two dozen U.S. embassy personnel and family members with maladies, including hearing loss and brain injury. As the mystery lingers—and finger pointing across the Florida Straits gets sharper—the United States and Cuba look perilously close to reigniting a Cold War that ended just three years ago. The Trump administration has withdrawn almost two-thirds of its Havana embassy staff as a result of the controversy—and so far expelled 17 Cuban diplomats from their embassy in Washington. The State Department has stopped issuing new U.S. visas for Cubans and has issued a warning to Americans about traveling to Cuba. All that is fine with the anti-communist hardliners here, and the communist hardliners there, who opposed the 2014 normalization of relations between the two countries after more than half a century of hostile estrangement. But reversing normalization is risky for both the United States, which needs it to influence democratic reform in Cuba, and Cuba, whose economy is tumbling once again. 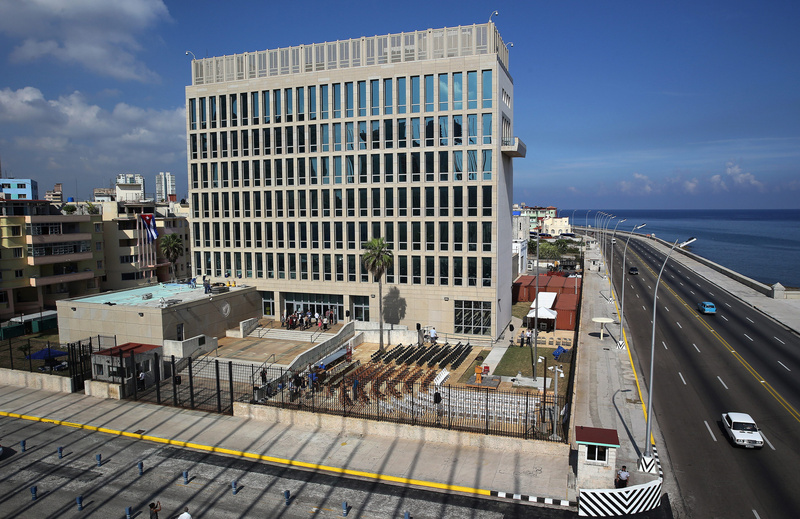 The alleged attacks started last fall and initially targeted U.S. agents stationed at the U.S. embassy in Havana. The alleged attacks started last fall and initially targeted U.S. intelligence agents stationed at the U.S. embassy in Havana. Regular diplomats eventually fell victim as well. The source of the sonic assaults is still unknown, but they apparently took place inside the Americans’ Havana residences (and in one alleged instance in a Havana hotel). Canadian diplomats in Cuba have reported similar cases. Suspicion immediately fell on Cuba’s communist regime, which is notorious for its ubiquitous surveillance system. Since this was pretty sloppy surveillance, intelligence experts hypothesized a high-tech eavesdropping operation gone awry. Not surprisingly, Cuban President Raúl Castro personally insisted to U.S. officials in Havana that Cuba played no role in—and knew nothing about—the attacks. That turned speculation to the possibility that a cell of regime hardliners had gone rogue to strike at yanqui spies. Or that a third country, such as Russia, which is infamous for ham-handed spook work, had acted covertly. But even if the Castro government was not directly involved, the Trump administration finds it hard to believe the attacks could have escaped Havana’s Orwellian oversight. Beyond the question of who is responsible is the more perplexing issue of what was behind all this. That has opened the door to any number of alternative theories, such as carbon monoxide, which can also cause inner ear problems. Whatever the cause, the void of consensus has raised concerns that the Trump administration’s responses are rash. Or, say critics, the responses are designed to appease anti-Castro hawks, like Florida Senator Marco Rubio, who are disappointed by President Trump’s modest rollback of normalized relations with Cuba. The Trump administration, however, says it is just as impatient with Mr. Rodríguez and the Castro regime for not being more forthcoming. Aside from the injured victims, the other losers in this diplomatic dust-up may be Cuba’s fledgling entrepreneurs. Many of them are trained in business by Cuba’s Roman Catholic Church, and many of them depend on U.S. customers who are now balking at visiting the island. Those private business owners are considered the vanguard of Cuban reform. But all that could be put on ice indefinitely if the Cold War returns. Ask any Cuban refugee if they are surprised. Given that our family members were murdered under Castro, none of these findings are shocking. Raul Castro was Fidel Castro’s enforcer of death squads (fusilamientos). Obama apparently cares little for history and was obsessed with his legacy. Injured US Diplomats on Cuban soil are Obama’s pathetic legacy. Add that to his infamous legacy at the hands of the assassin Raul Casteo. Nonsense. You clearly know nothing about the history of the US and Cuba, nor the history of the US attacking itself and its people for the gain of the greedy. Of the US and Cuba -- the two parties here -- only one has any perceived benefit: the one that wants your vote, you gusano blowhard. While I am one to be suspicious of Cuba. Raul did invite the FBI to investigate and they are. Nothing has been found. If Cuba were behind it, they would not have been so foolish as to let US investigators in. Tim Padgett is a writer based in Miami, Fl.